Four Decades of CFD: Looking Back and Moving Forward is a symposium that will honor the careers of three giants of CFD: Anthony Jameson, Phil Roe, and Bram van Leer. The objectives of the symposium are to evaluate the current status of CFD and to chart its future. Attendance will be capped at 150. Don’t delay your registration. 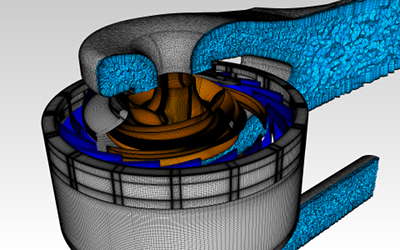 A team of engineers at CRAFT Tech won Pointwise’s Meshy Award for 2013 for their hybrid mesh for a low head safety injection pump for nuclear reactors consisting of 21.5 million cells and over 950 topological zones including the inlet, impeller, leakage flow paths, diffuser, collector, and discharge flow paths. The Meshy Award 2013 winner from CRAFT Tech. 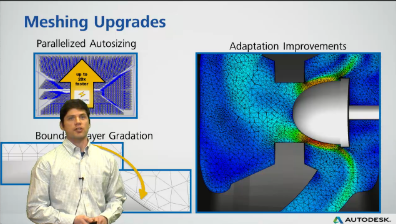 Take eight minutes to watch this video about what’s new in Autodesk Simulation CFD 2014. Are you aware of CEI’s Python Exchange where you can download scripts that add capability to Ensight? Aerodynamic Solutions seeks participants to beta test their cloud-based CFD product, Cloud Leo. TransMagic R10 for CAD data exchange was released with support for new CAD formats, XML output, and Windows 8 support and many other features. Screen capture from Autodesk’s video about CFD 2014. A preliminary agenda was announced for the NAFEMS World Congress (coming this June to Salzburg, Austria). Keynotes will be delivered by Ralph Sundermeier (Volkswagen), Frank Popielas (Dana Corp.), Jérôme Buffe (Thales Alenia Space), Koichi Ohtomi (Toshiba), Steven Sirman (Tata Steel Automotive), Harald Hasselblad (Volvo), and Grant Steven (Univ. of Sydney). The SIAM Conference on Geometric and Physical Modeling will be held 11-14 November 2013 in Denver. The abstract deadline (8 April) is rapidly approaching. The agenda for May’s Collaboration and Interoperability Congress includes the NASA/ESA product data meeting, the PDES board meeting, and the 3D PDF consortium meeting. Speakers include Thomas Kurfess, assistant director for advanced manufacturing at the office of science and technology policy in the executive office of the president of the USA. The abstract submission deadline for SC13 (i.e. Supercomputing) has been extended to 19 April. Next week’s CFD seminar at the National Institute of Aerospace will be on multigrid schemes in DLR’s Tau Code. In her post-event blog post about CD-adapco’s STAR Global Conference, Monica Schnitger shared these interesting nuggets. One third of CD-adapco’s 750 employees are developers. CD-adapco’s revenue this year will approach $200 million. A SpaceClaim client is coming. Support for 32-bit Windows and 32-bit Linux is going away in 2014. It seems that there’s been a new survey in the CFD/CAE business every couple of weeks since the beginning of the year. The latest is a combined effort by ANSYS and the Aberdeen Group by which they intend to “identify the latest trends for improving product development efficiency using simulation.” Participants are promised “first access” to the results [i.e. you’ll be one of the first who has the opportunity to pay for the report] shortly after 30 April. The survey takes 15-20 minutes to complete. It appears that simFlow is a CFD consultancy based on OpenFOAM. Vol. 27, Issue 2 of the International Journal of CFD is now online. Taylor & Francis is celebrating the 20th year of this journal by providing free access. Peterbilt used CFD to improve the aerodynamics of their super truck and doubled its gas mileage. CFD isn’t just for your grandfather’s aircraft. Check out what they’re doing with kiteboards at Flysurfer. Pressure distribution (colors) and streamlines around a Flysurfer kite. Image from Flysurfer. Prof. David Schmidt of the Univ. of Massachusetts, Amherst will spend one month this summer on adding an Eulerian spray model to CONVERGE CFD. Read about state-changing metal oxides and how they may make silicon-based transistors irrelevant, especially in 20 years when it’s predicted that their rate of advancement will flatline. Artist Paolo Wang was learning how to use RealFlow to do fluid simulations and the result was a short video called Splash. Imagine what he can do now that he’s learned the software. 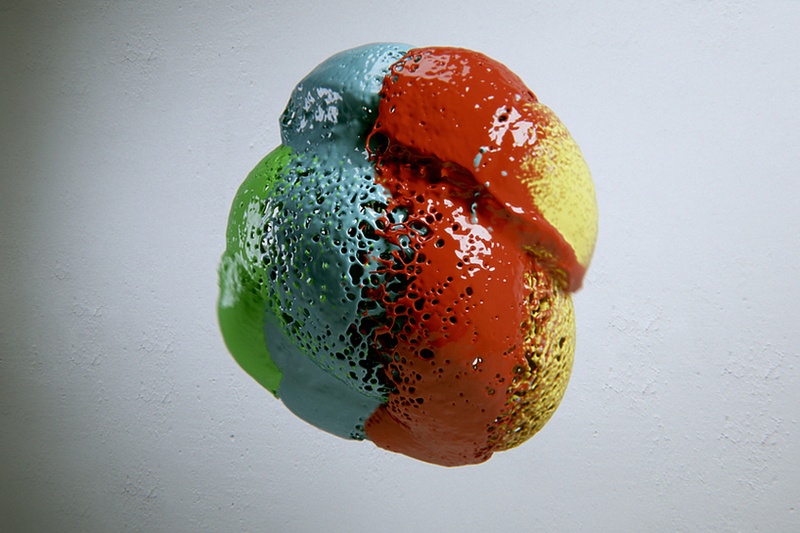 Part of a fluid simulation from Paulo Wang’s video Splash. This entry was posted in Applications, Events, News, Software and tagged ANSYS, Autodesk, CD-adapco, CEI, Cloud Leo, EnSight, NAFEMS, OpenFOAM, Pointwise, SIAM, simFlow, Tau, TransMagic. Bookmark the permalink. I just wanted to mention that NTRS is still down to the public, and I’m starting to get, um, nervous. It’s been down since the 20th of March for review of export controlled data. However, NASA has had a review policy in place for a long time and what’s on there doesn’t seem much different than AIAA, etc. I’m crossing my fingers that it comes back up. Have you heard anything? There seems to be very little internet talk about it. No, Martin. I haven’t seen or heard any news about NTRS being down or when it might come back online. You’d like to think they would’ve had this export thing figured out a long time ago. I talked with a NASA library branch and STI. None of us are lawyers, so take this with a lot of salt. In a nutshell, if one can find the document in the public domain, (library, internet, etc.) then the document is not controlled. However, if it can only be found on NTRS/NASD then, at the moment, it is probably controlled, regardless of the distribution statement. A U.S. Citizen does not even have access to the catalog, even though a U.S. Citizen does have access to the NASA library and the hard copies. A government contractor does have access, but that means, I assume, it’s limited distribution. Neither source knew when NTRS will be up. It could be tomorrow, next month, or longer. I tried getting in contact with the public policy people at AIAA, but haven’t heard back. In the old days, i.e. more than 10 yrs ago, when the distribution changed on a document the libraries were told to remove or remark the document. No one put a padlock on the libraries until everything was sorted out! Given what the individual said at STI, and it’s a little fuzzy so don’t take this too far, but, it may be that they are examining older documents (even going back to 1950s?) to see if their distribution is in compliance with current export regulations. Thanks for the update, Martin. I’m guessing that the closure of NTRS is related to the recent incidents with personnel at Langley and Ames which seem to imply confusion about what is and isn’t export controlled. Yes, and I gather the politicians and lawyers don’t see eye to eye with the engineers and scientists. Doesn’t take a rocket scientist to figure out who will be the losing team! Sure does make CFD V&V interesting. I wish NASA would do more race car and sport aerodynamics.